At the heart of the AA program are the 12 principles "suggested" for recovery, called the 12 Steps of Alcoholics Anonymous. These are specific individual actions, spiritual in nature, and "guides to progress, not perfection" (AA World Services, 1976, p. 60). They were painstakingly designed by fellow alcoholics to help a person obtain sobriety and make the spiritual transformation necessary to create a sober life worth living. For the developing AA groups to survive and function effectively, a set of principles called the 12 Traditions evolved to set forth a working philosophy for this mutual help community. The foreword to the second edition of Alcoholics Anonymous (AA World Services, 1955) explained the 12 Traditions as they apply to community: No alcoholic man or woman could be excluded from our Society • Our leaders might serve but never govern • Each group was to be autonomous and there was to be no professional class of therapy • There were to be no fees or dues • There was to be the least possible organization, even in our service centers • Our public relations were to be based upon attraction rather than promotion • All members ought to be anonymous at the level of press, radio, TV and films • and in no circumstances should we give endorsements, make alliances, or enter public controversies, (p. vii) The program is recognized by many professionals as one of the most effective and user-friendly resources for helping alcoholics (Riordin & Walsh, 1994). Attributes of the program important to many therapists include the lack of dues or fees, its availability in small towns, and the fact that in medium to large cities the program usually offers an array of options for a variety of groups. In spite of methodological problems aggravated by the anonymous, voluntary, self-selection of AA membership, there is evidence to indicate that AA is a very useful approach for alcoholics who are trying to stop drinking. Emrick's (1987) review of surveys and outcome evaluations of AA alone or AA as an adjunct to professional treatment indicated that 40 percent to 50 percent of alcoholics who maintain long-term, active membership in AA have several years of total abstinence while involved; 60 percent to 68 percent improve, drinking less or not at all during AA participation. A meta-analysis by Emrick, Tonigan, Montgomery, and Little (1993) of 107 previously published studies found that greater AA involvement could modestly predict reduced alcohol consumption. Involvement or active participation in AA processes (such as "working the 12 Steps"), rather than just attendance at AA meetings, was related to positive outcomes in these findings and supported in other studies (Montgomery, Miller, & Tonigan, 1995; Snow, Prochaska, & Rossi, 1994). Recent findings also suggest that length of AA attendance is correlated with months of abstinence (McBride, 1991). Combined with formal treatment programs, attendance at AA was found to be the only significant predictor of length of sobriety in a 10-year follow-up study of male and female patients, suggesting successful outcomes for people involved with both (Cross, Morgan, Mooney, Martin, & Rapter, 1990). Other studies support the idea that AA is beneficial as an adjunct to formal treatment and when used as a form of after care (Alford, Koehler, & Leonard, 1991; Walsh et ai.,1991). These positive findings do not satisfy the skeptics. Major criticisms include the large percentage of alcoholics who drop out of AA (according to AA's own survey, 50 percent after three months) (Chappel, 1993; Galaif & Sussman, 1995); contradictory studies indicating that AA works no better than other approaches, including no treatment (Miller & Hester, 1986, Peele, 1992); and findings that indicate no significant relationship between AA attendence and outcomes (McLatchie & Lomp, 1988; Miller, Leckman, Delaney, & Tinkcorn, 1992). In addition, methodological problems endemic to research on AA lead some researchers to dismiss such attempts as mere exercises in speculation ("Treatment," 1996). For example, despite years of research, no definitive picture has emerged of the personal characteristics that can predict a positive or negative outcome with AA (Tonigan & Hiller-Sturmhofel, 1994). The basic text of Alcoholics Anonymous (AA World Services, 1976) suggests that "for those who are unable to drink moderately the question is how to stop altogether. . . . We are assuming, of course, that the reader desires to stop" (p. 34). A fundamental concept of the AA program is the need for self-assessment; its basis is the belief that all alcoholics want to stop drinking precisely because their own experience and numerous experiments tell them they can no longer control it once they start. The voluntariness of this approach is often not emphasized by alcohol treatment programs, court systems, licensing boards, and certain employers who require abstinence, drug testing, and attendance at AA meetings. In contrast, AA members who begin working with other alcoholics are advised to "be careful not to brand him as an alcoholic.. . . Let him draw his own conclusion" (AA World Services, 1976, p. 92). AA recommends their program only to those who realize, as a result of their own self-assessment, that they can no longer control their drinking. However, abstinence (in the sense of "never drink again") was considered too unrealistic, too absolute, and perhaps too frightening to the alcoholics who created the AA program. Instead, they developed the idea of limited control, that is, not drinking "one day at a time," instead of forever. According to Kurtz (1979), this message serves both to "protect against grandiosity and to affirm the sense of individual worthwhileness so especially important to the drinking alcoholic mired in self-hatred over his failure to achieve absolute control over his drinking" (p. 105). The concept of limited control and the embracing of human fallibility are other examples of how the AA program stands apart from the dominant culture's obsessive drive for perfection. Several AA slogans underscore the concept of limited control, such as "progress not perfection," "easy does it," and "one day at a time." Recovery is seen as an ongoing process, more in tune with the feminist principle of emphasizing "process not product" (Van Den Bergh, 1991). The AA premise of stopping drinking "one day at a time" is certainly not the only approach to recovery. Other approaches and resources that have had some reported positive outcomes include acupuncture, biofeedback, pharmacotherapy (such as methadone maintenance for heroin addiction and antabuse and naltrexone for alcoholics), behavior modification, cognitive restructuring, and traditional Minnesota model treatment programs that range from intensive inpatient to outpatient services and that are usually abstinence oriented. The problems, consequences, and social context associated with alcoholism are so varied that a single treatment strategy is unwise ("Treatment," 1996). The AA program does not take a stand on various treatment strategies, saying instead "upon therapy for the alcoholic himself, we surely have no monopoly" (AA World Services, 1976, p. xxi). 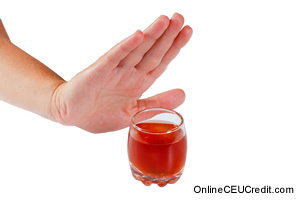 In the addictions field, programs or research that suggest that an alcoholic can return to "controlled drinking" are seen as diametrically opposed to the AA premise of stopping drinking (McNeece & DiNitto, 1994; Riordan & Walsh, 1994). On one level of meaning, it is not surprising that the idea of teaching an alcoholic controlled drinking strikes the AA member as absurd, because in AA the alcoholic is self-defined as a person who cannot control his or her drinking. For those who can control it (through whatever means), the message is "our hats are off to him" (AA World Services, 1976, p. 31). On another level of meaning, focusing on controlling drinking misses the point. According to AA, the alcoholic that has lost control does not just have a bad habit and does not just need to stop drinking. That is only the first step in eliminating an "alcoholic" lifestyle based on self-centeredness, immaturity, and spiritual bankruptcy (Flores, 1988; Kurtz, 1979). Because AA views the alcoholic as having a three-fold problem, involving mental, spiritual, and physical suffering, eliminating drinking is only the first step, although it is both necessary and essential, to begin the process of recovery. - Davis, D., & Jansen, G. G. (1998). Making Meaning of Alcoholics Anonymous for Social Workers: Myths, Metaphors, and Realities. Social Work, 43(2), 169-182. The preceding section contained information about the "one day a time" approach in Alcoholics Anonymous. Write three case study examples regarding how you might use the content of this section in your practice. In Alcoholics Anonymous, what is meant by "limited control"? Record the letter of the correct answer the CEU Answer Booklet.